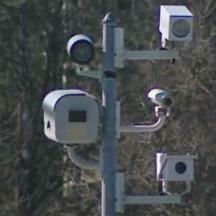 A visitor to our website has videotaped a red-light camera vendor's van in violation of state law. Maryland law requires all vehicles (with the exception of motorcycles, tractors, and trailers) to have both front and back license plate. But red light camera vendor 'LaserCraft' appears to be operating a vehicle in violation of this statute, a vehicle without a front license plate. We'd encourage LaserCraft to pay the government the $60 fine they owe. And we'd encourage any of our viewers who see such violations to report them to the proper authorities (that would be us). Yes camera pushers, the people whom you would watch are going to be watching you.